The above picture was drawn by my son. He is 4 and a half. Tonight I'm looking at the picture and talking it over with my husband. How sweet it was that he wanted to draw a picture of me, how sweet that he wrote me a note. How (if you could see the rest of the picture) he drew himself with hair sticking up and his sister with pigtails. Then it dawned on me what I'm wearing in the picture. Look at it. There is a dress, floor-length, with those little sweepy things that Cinderella has on her gown, and circley puffy sleeves (I'm getting really technical with my fashion lingo here). He drew me in a princess dress. 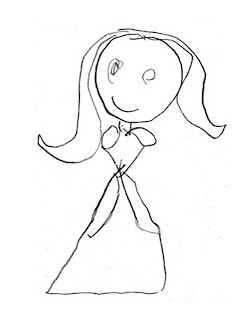 We started discussing it, and all the pictures my son draws of me, and I realized...he always draws me in a princess dress. Mind you, I never have ever walked around the house wearing a princess dress (a wedding dress? yes...once, but princess dress? never). I walk around the house wearing jeans, or sweats, or a bathrobe...not a ball gown. 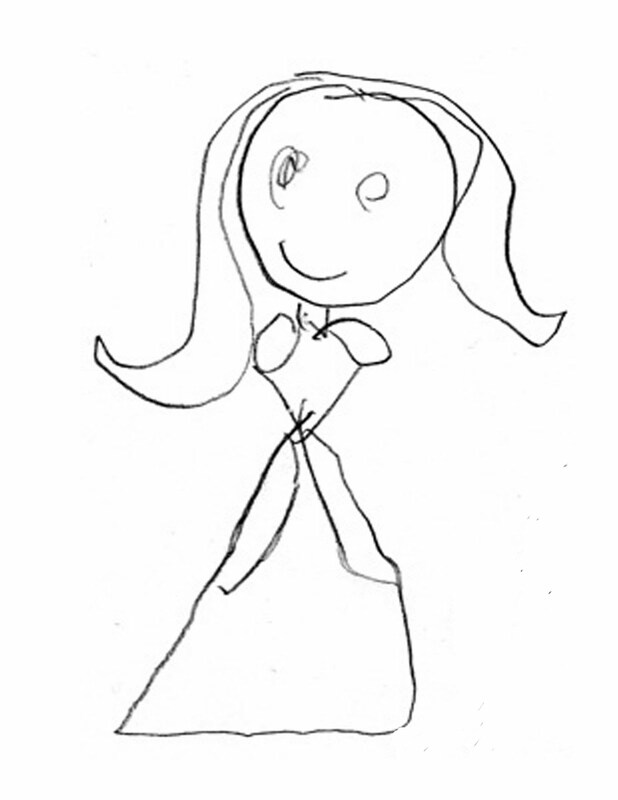 Still, when my son is asked to draw a picture of me...I am a princess (a princess with no arms usually, but a princess nonetheless). It started me thinking about God. And how this is true of our relationship with him as well. If God were to draw my picture, what would he draw? A prideful woman, who constantly demands her own way? A gossip? Maybe the incredible hulk (thinking of my propensity for anger)? No, none of those things. I'm convinced that if God were to sit down and draw a picture of me (I'd have arms) and would also look like a princess. Not because I am worthy. Not because I am smart enough, funny enough, skinny enough, patient enough, or deserving enough. But because I am his. A daughter of the king. Because his Son died for me and now, because of the righteousness that was won on my behalf, I am near, and rejoiced over. And I don't know about you, but someone thinking I'm a princess, makes me a lot more likely to act like one. Love. A LOT. So sweet!